Once you’ve passed that 30-year old plateau, the complexity of your neighborhood, town/city, state, country . . . and the larger world out there, begin to concern you. No? There are all of those weighty ‘problems’ that experts assure you must be confronted, and overcome. Few of us wither under the volume of these issues, but they do capture vital corner of our brains. Good then that all who come to see our blog, and blogs like it, happily soar to higher bliss when we meet the countless triumphs that we find in the field. Here we share one. One-half of the morning has slipped by, and the field in Mishmarot, Israel has delivered up a large number of fresh, vital butterflies. That’s good. Better again came this sighting. 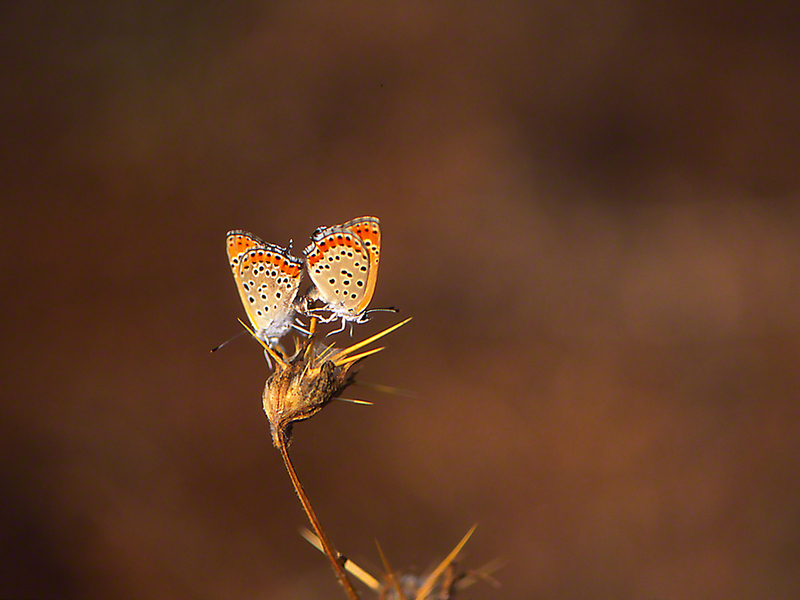 A pair of Lesser Fiery Copper butterflies, mating. Wow! Healthy, active, color-rich butterflies striving to produce progeny. What an uplifting moment. Wild beings navigating their world of open spaces, determined to produce the best, most vigorous offspring, and unconsciously depending upon us to support their existence and their relatively minute life space. An instantaneous wash-away of any and all anxious concerns, those replaced by: Life is good, and these butterflies seem to encourage us to keep it that way. Those mornings working the fields surrounding Mishmarot were good, better, best! Butterflies of Israel’s coastal plain came out in full regalia to greet me, and many offered their best poses, some giving me extra time to snap dozens of images. I’m nearing the end of my read of Birdwatcher, a biography of the great American bird enthusiast, Roger Tory Peterson. Peterson, too, took dozens of exposures when he saw a bird in the right plumage, in the best spot, and with good light, wind, humidity, etc.. Carefully take mucho images, and perhaps one will be a very special keeper. All those mornings, I was constantly under surveillance. Israel’s IDF (NO), the Israeli Mossad (NO), Israel police (NO). Who then? Lizards, lizards watched me, most scurrying away when the found that I ‘made’ them, even though they blended so well with the terrain. All of this was a bit distracting, because my eyes should have been seeking butterflies, 100% of the time. That being reminded that I was watching for snakes 6.8% of the time. So I was a seeing lizards, lots of them. This morning I saw this one, so much bigger than any of the dozens of other that I had seen. Ah, this was a ranking lizard, from lizard HQ, directed to report to my location, and see me for itself. I had fun with this little thought . . . then I went back to my work, getting those 3 out of 100 slide images that will find a home in my Neumade slide cabinets. He, or in Israel this ranking lizard might well be a female operative, spent some time observing me, then, satisfied that I posed no security risk, it began its hike back to lizard headquarters. Such is how my mind skips along in the field. 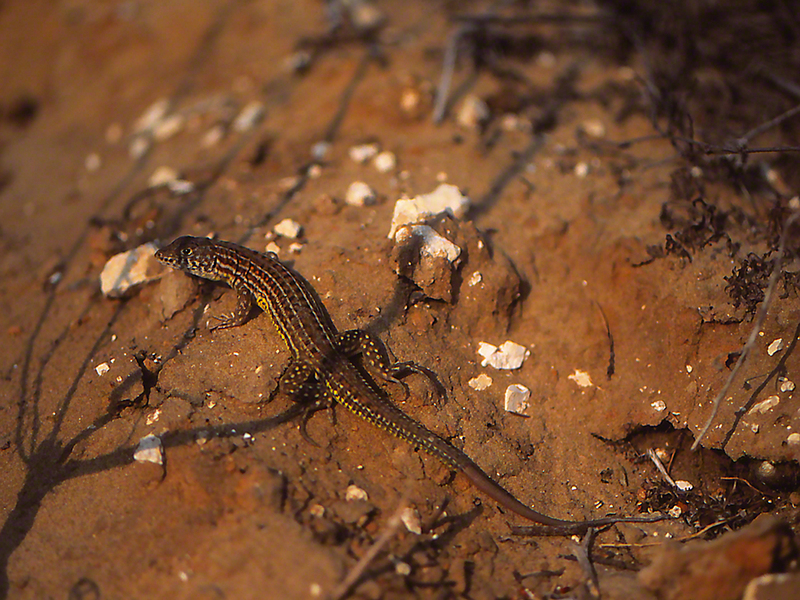 Species of lizard, dare I hope that we will get that from the collegial lizard naturalists of beautiful Israel? We posted this memorable beetle some weeks ago, under the title “And who . . . ?” Spotted this dazzler on a trail near the top of Mt. Hermon in Israel’s Upper Galilee region. Waited, hoping for help in identifying our starkly beautiful insect. Got tired of waiting, and utilized Oz Rittner’s website to ID this animal. Trichodes affinis is this species of beetle. I am ½ way through reading a biography of Roger Tory Peterson (Wonderful reading! 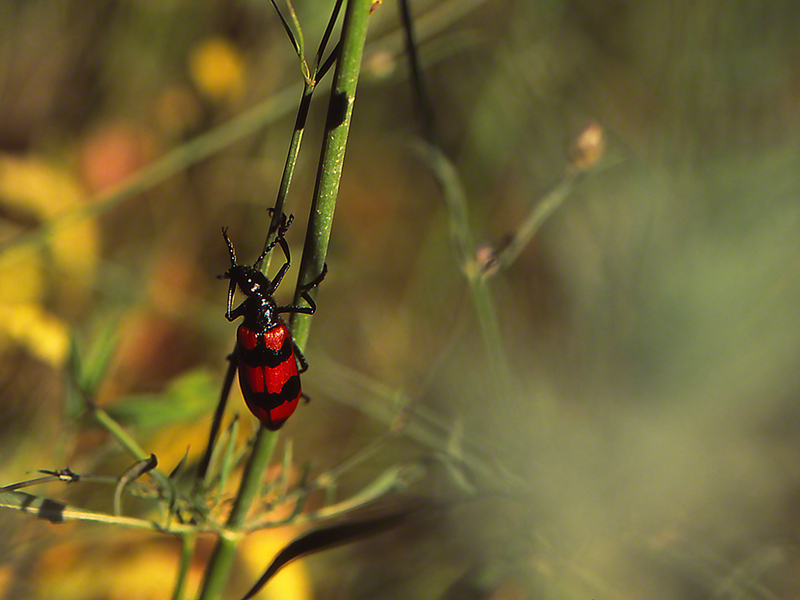 ), and that so reminds me that when I spotted this red and black beetle, it was a tickler, reminding me of the great diversity that continues to grace our world, and of the pleasures awaiting us each and every time that we can get out there and experience them. Could not find an english name to this one? The advice that I was given in Israel was spot on. To capture good images of the butterflies that I wanted, on Mt. Meron in the very north of Israel, get there early, very early. How early? 6:30 in the morning. The alarm was set for 4 A.M. each of the 5 mornings that I guested at the SPNI field house at the foot of the mountain. By 6:15 each morning, I reached the trail near the top of the mountain. Great advice. Butterflies were just leaving their nighttime roosts. Sluggish, too cool for full-speed flight, they searched for good perches to warm in the morning sun. The morning sun in the Holy Land comes on with impressive intensity. That’s the back story for this image. 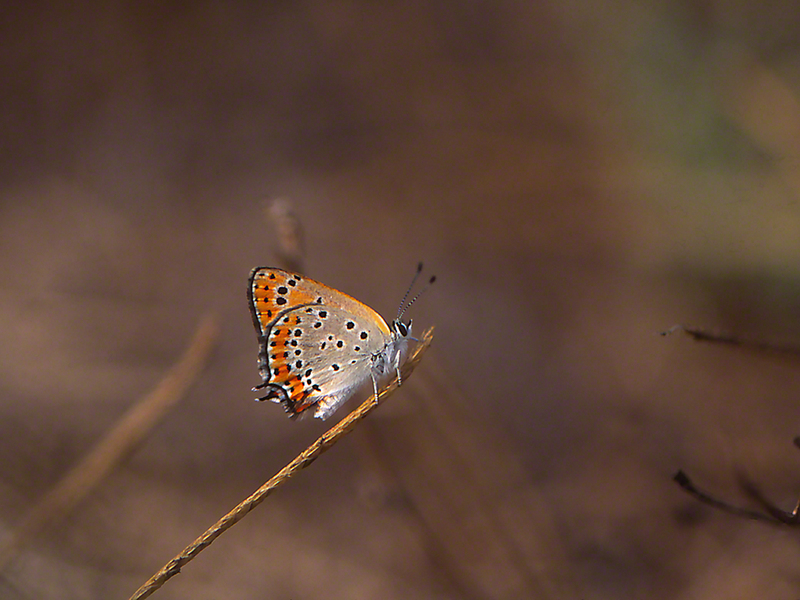 Lycaena thersamon didn’t object to my approach. Rich color, full wings. The start of a very good morning, July 2014. Close. Get Closer. Oh, oh, oh! Fresh, sparkling color and . . . not bird, lizard, insect struck. Right up to her. I took 2 exposures when I was 3 feet away from her. She is tiny, so I carefully (See Technique feature above) continued my robotic approach. I’m in position for my macro- work, and the beauty continues to nectar, some 12″ from my macro- lens (100, 2.8). She is wonderful. 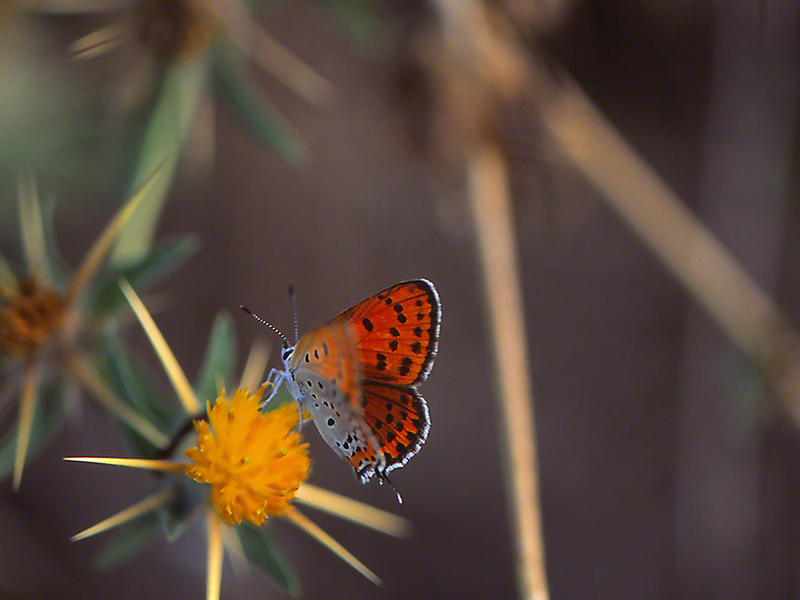 Known as the Lesser Fiery Copper, related to the American Copper butterfly that we enjoy here in the northeastern U.S.. One of the very small butterflies that hikers usually overlook. Why? my eyes were always attuned to birds, butterflies, grasshoppers, bees, flies, botany (all), squirrels, chipmunks, cottontail rabbits, whitetail deer . . . ? Oops! slow down, Jeff. In closing, I love these tiny coppers, all bedecked, fearless, purposeful.